- No Breakfast. Studio room Area: 38 Sq.M. Comes with 1 King Size Bed. 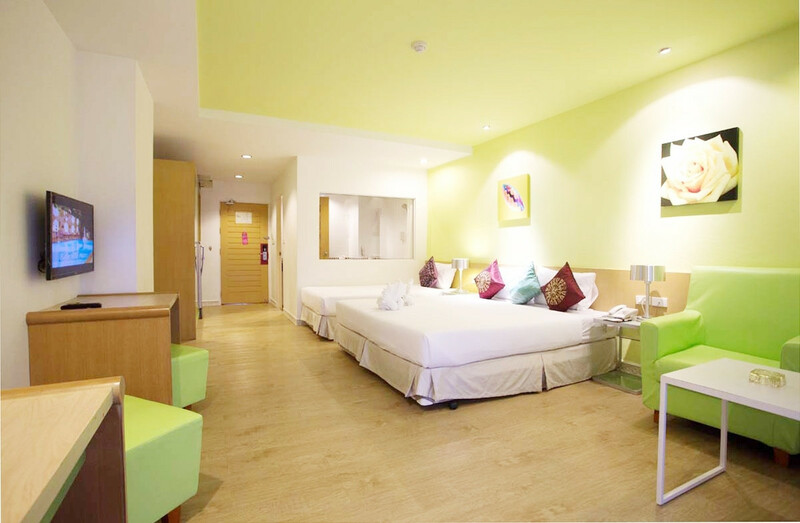 - Two Children below 12 years old can stay free of charge using existing bed and no breakfast. Facilities: Balcony, Air Conditioned, Shower over Bath Tub, Flat Screen TV, Free WIFI in room, Hairdryer, Refrigerator, Microwave, Dining Plates, Safe with personal locking code, Pantry with washing sink, and water heater. No deposit will be charged at the time of booking. Guests will pay full amount directly at the hotel counter upon arrival. - Deluxe Standard with breakfast. Studio room Area: 38 Sq.M. Comes with 1 King Size Bed. - No Breakfast. - Studio room Area: 40 Sq.M.-Twin Bed or Double Bed is available. - Include Breakfast. Studio room Area: 40 Sq.M.-Twin Bed or Double Bed is available. - No Breakfast - Studio room Area: 42 Sq.M.-Twin Bed or Double Bed is available. - Include Breakfast. Studio room Area: 42 Sq.M.-Twin Bed or Double Bed is available. - No Breakfast. Maximum of 3 adults can stay. Studio room Area: 42 Sq.M.-Comes with 1 King Bed + 1 Single Bed. - One Child below 12 years old can stay free of charge using existing bed and no breakfast. Facilities: Balcony, Air Conditioned, Bath Tub, Flat screen TV, Free WIFI in room, Hairdryer, Refrigerator, Microwave, Dining Plates, Safe with personal locking code, Pantry with washing sink, and water heater. 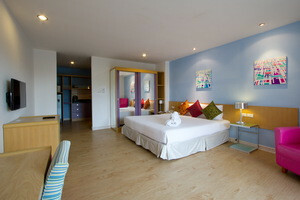 - Maximum of 3 adults can stay include breakfast. Studio room Area: 42 Sq.M.-Comes with 1 King Bed + 1 Single Bed. - Bright & Stylish two bedrooms and two separate bathrooms suites with living area and balcony. 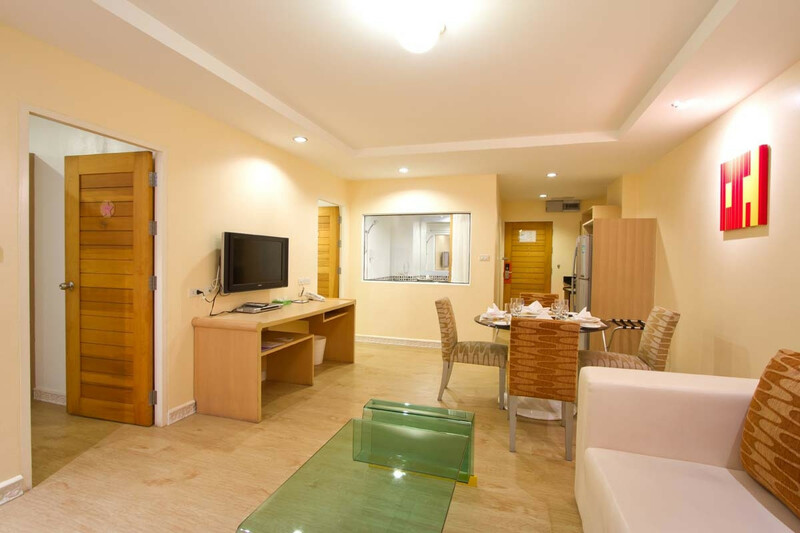 You can enjoy the beautiful view of Pattaya bay and nice sea view while you stay in the room. Living room area provides you with a comfortable L shape sofa and dining table. Well equipped with Hairdryer, Refrigerator, water heater, safe with personal locking code, LCD TV and DVD player, pantry with microwave oven and dining set for your conveniences. - Four Children below 12 years old can stay free of charge using existing bed and no breakfast. - Bright & Stylish three bedrooms and three separate bathrooms suites with living area and balcony. Recommended for big family or group traveling. 3 king-sized bed and 1 single bed for your group. 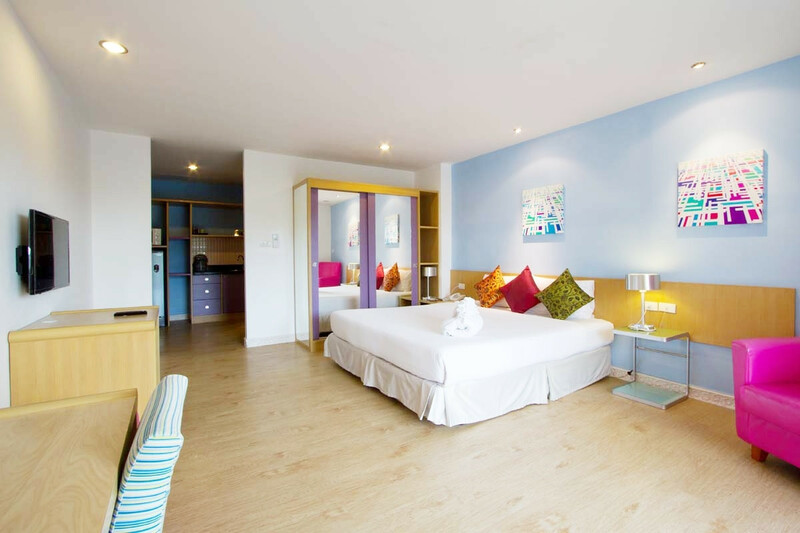 You can enjoy the panoramic view of Pattaya bay and nice sea view while you stay in the room. Living room area provides you with a comfortable L shape sofa and dining table. 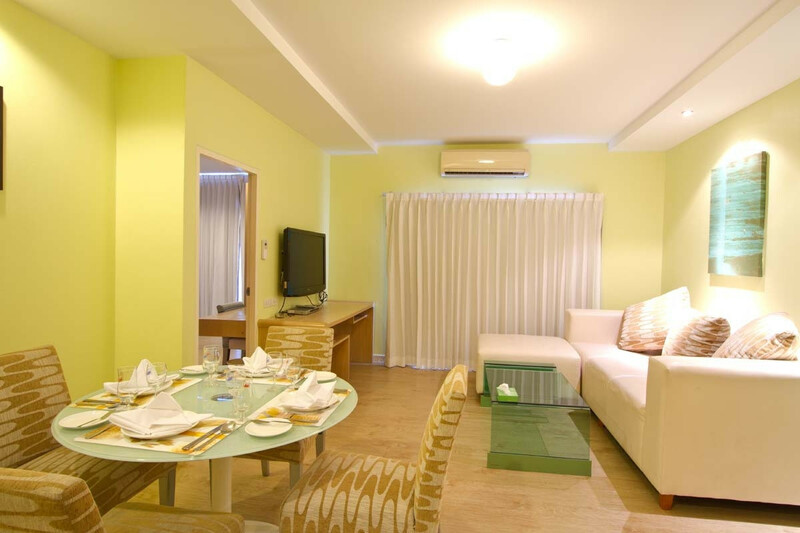 Well equipped with Hairdryer, Refrigerator, water heater, safe with personal locking code, LCD TV and DVD player, pantry with microwave oven and dining set for your conveniences. - Six Children below 12 years old can stay free of charge using existing bed and no breakfast.